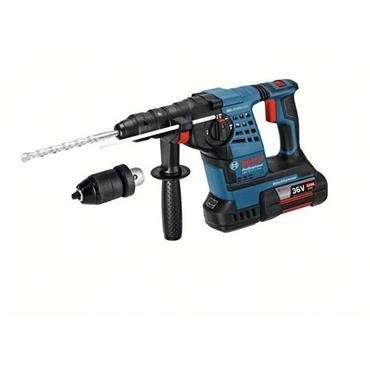 Bosch GBH 36 VF-LI 36 Volt SDS Cordless Rotary Hammer Drill is three functions (drilling, hammer drilling and chiselling) and two chucks, the GBH 36 VF-LI is as versatile as it is powerful. It comes complete with a keyless chuck, making it also suitable for straight shank drill bits in wood and metal. 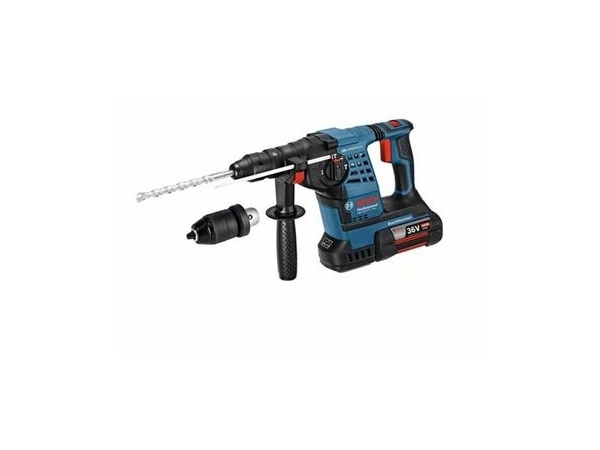 The Bosch GBH 36 VF-LI is fast and stands up well against 2 kg mains-powered hammer drills. As powerful as mains powered units, the GBH 36 VF-LI will drill 220 holes (6 x 40 mm in C30/37 concrete) with only one battery charge. All this makes it an ideal choice for a site or outdoor use. It features a forward/reverse switch, overload clutch and a LED work light. The Innovative CoolPack battery ensures optimum heat dissipation, which increases its lifetime by up to 100 per cent. Supplied with one 4.0Ah battery, charger and L-Box.